Nature Guide to the Northern Forest, by Peter Marchand, 2010. 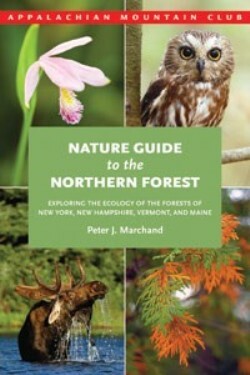 Expanding on his previous book, North Woods, naturalist Peter Marchand has fashioned a superb natural history guide for the forests found in the mountains and northern areas of Maine, New Hampshire, Vermont and New York. After reviewing landscape-level influences of natural and human history, the author describes the forest and alpine communities of the region, as well as signature plant and animal species. Additional chapters cover seasonal changes and future trends of climate change and species movement. Includes numerous color photos. 192 pp., 5 1/4" x 8 1/4."